(ALBANY, Ga)- Dougherty County law enforcement held a second Criminal Justice Forum Thursday evening. Dozens of concerned citizens packed into the community room at the Albany Police Department to voice their concerns. Their concerns were answered by a panel of law enforcement officials. 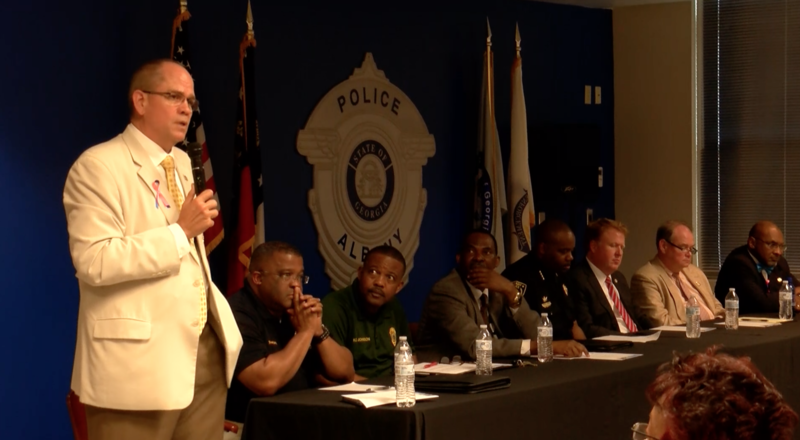 The panel included Albany Police Chief, Michael Presley, Dougherty County School System Police Chief, Troy Conley, and Sheriff Kevin Sproul. Concerns ranged from gang violence, an active school shooter drill for the Dougherty County School system, and reform for gang members to name a few. Sherif Sproul says that having these Criminal Justice Forums is a good way to get feedback directly from the public. You have to have these so we can hear them publicly, live on the same stage and not through Facebook, or Instagram, or whatever it is on social media,” says Sproul. Law enforcement have no set date at this time for a third Criminal Justice Forum.